Meet the delightful team behind Rustici Software. We're always proud of how long people choose to work for our organization, which is why we've organized this page by tenure. Joe is here for you, the customer, the prospect, anyone who needs help with SCORM, xAPI, or our products. Part customer advocate, part drill sergeant, Joe helps our customers get what they need and helps projects stay on the straight and narrow. Joe’s also seen nearly as much SCORM stuff as the SCORM Engine, since he’s been supporting it since its inception. As milo1973 on Xbox Live, Joe is convinced that Halo and NHL 2009 are ripe for SCORM-ifying. He’s also mostly forgone Ping Pong in favor of Magic: The Gathering. Most of that isn’t accurate anymore, but Joe does still play Magic: The Gathering. He’s also very proud to be employee #1 on the Rustici tenure ladder. Brian implemented the SCORM Content Player and the SCORM Engine against an LMS at his former company Evolve Learning. He was so easy to work with and understood things so well that when he came back looking to work with us years later, we couldn’t ignore him. Now Brian provides that same service to our customers. Brian’s built his own LMSs, and he’s seen the inner-workings of countless customer LMSs. When it comes to xAPI, Brian is a real pioneer. He even chooses to spend his time off building his own xAPI projects…he’s even xAPI-ified Minecraft! Brian is currently working on software development for the Cloud team. When Ben became available on the job market, we jumped at the chance to get him to join us. 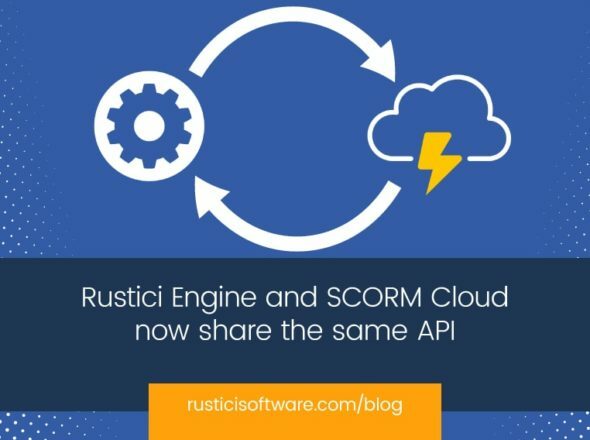 He’s a legitimate challenge to Mike Rustici’s throne as SCORM wizard and – bonus! – came complete with collar. (We’re not sure he owns a t-shirt, actually.) Ben’s work with Mike on the ADL Technical Working Group had impressed us for years and as SCORM moves through a necessary evolution, Ben adds to our bandwidth on standards development activities. Heck, he wrote the first draft of xAPI. Ben is what some folks might call a Yankee and his trips to the Franklin office have involved adventures in grits, fried catfish and turnip greens. He’s also a serious guy who only has one face for the camera, despite David’s best efforts to provoke a different reaction. Tammy also instills fear in Rustici Software employees because she can run, or swim, or bike, forever. We mean it. She’s an Iron(wo)Man many times over! It is this persistence and attention to detail that attracted us to Tammy in the first place. As the Director of Accounts and Marketing, Tammy wears a bunch of hats around here. Chances are, if you are a customer of ours, you’ve talked to Tammy at some point. We knew that Chris, our director of sales, was going to fit in here when he told us stories from a prior job in which he visited various Walmarts, teaching the disinterested staff about how to sell satellite radios. When your job will revolve around explaining eLearning standards and educating people about them, patience and teaching become pretty important. Chances are that if you need something from us, then Chris is your man. Chris and Andy round out our sales team, even though our sales process isn’t typical. Some might say that Chris is the most innovative pong player in the office. He also takes interest in birds and catches them regularly around the office. See Exhibit A, Exhibit B. There are many things that could be said about TJ. He is passionate and expressive and has the most distinctive laugh in the building. TJ has served in various roles from software development to technical sales and Director of Products, but most recently has stepped into the role of CEO. And, we’re pretty excited to call him Boss. Andy is the office jokester — ask him about his puns! (Actually, you don’t have to ask him. He’ll tell them to you. Over and over and over again.) He also collects rubber animal head masks (like this) and his current collection consists of heads of a horse, squirrel, kitten and german shepherd. He’s a music fanatic, and currently working on creating playlists to represent his life in decades. He’s feeling pretty good about how ‘My 30s’ is turning out. We’re so happy for you, Andy! Andy recently started eating breakfast, and he’s thinking about working out. Andy has stopped eating breakfast and never took the leap into exercising. “It was a fail,” he says. Andy helps people understand what SCORM and xAPI are. He’s considered a “salesperson”, but we don’t do sales the way most companies do. There’s this problem. You see, we already have a Brian in the office, so adding a second one just confuses things. So, we’re calling the new Brian “Bobby”. It’s just easier for everyone (except maybe Bobby.) Update: we’ve settled on calling him B Miller. B Miller is a big Michigan sports fan, but mainly football. He’s studied organic chemistry, philosophy, and business, and seems to be the go-to guy in the office if you have a question about taxes or 401ks or investing… he’s a deep wealth of information! B Miller is working with xAPI and cmi5. His name is Tim, but we already have a Tim, so what are we going to call Tim Edwards? Tim E? Time? Tedwards? Ted? We’re going to try a few out and see what sticks. We decided on Tedwards. During the first fall in our new office, we repeatedly saw wild turkeys roaming in our back parking lot. Tedwards wanted to get bird seed to scatter about for them, but Tim (Martin, the other Tim) said no. (I guess he didn’t think it would be a great idea to encourage the turkeys to make home in our parking lot, or something like that.) We appreciate that about Tedwards, though. He’s thoughtful, asks questions, and has a big heart. For wild turkeys, anyway. He’s in the Dev Ops role, so he’s the one that makes sure that all of our products are always online, working, and that they’re running as efficiently and quickly as they can. Yep. It happened. We hired another Donnelly! And yes, they’re related. Ryan is Joe’s younger (more handsome) brother. Rustici Software just got much more awesome. Before joining us, Ryan worked in the music industry for 12 years. Click Check out his Spotify if you want to keep up with what he’s into these days. Ryan is part of our client support team alongside his brother Joe. Jim might just be the most normal one of all of us—he’s a great guy, and you always know what you’re getting with him but it’s all fun and games until you ask him to drive you to Chipotle, and then forget you asked and drive yourself. Of course, that wouldn’t be a thing that would happen at Rustici Software! It just seems like a thing he might not like. Jim gets credit for starting the ‘Rusticians with Bears’ thing around here. What started as an inside joke somehow became our official company mascot, and if you ever tour our office, you’ll see a few bears throughout. Jim likes reading sci-fi and biographies, he likes playing board games, and he plays guitar badly (he said so himself.) Sometimes, if we’re lucky, he’ll bring his guitar in on a Friday and strum around for a bit during our loosely-held late afternoon happy hour. Jim used to work on various products as a software developer, but now he’s a product manager. Josh has practiced Kendo for many years, which means he probably has a lot of patience and hand-eye coordination. He has two retired racing greyhounds, loves MMOs like Destiny and World of Warcraft, his favorite place in Nashville is The Flying Saucer. Josh is working on Content Controller. Laura is our Director of Finance and HR. She keeps a watchful eye on all things related to money and people and usually has somewhere north of 10 spreadsheets open on her computer at any given time. Like a lot of Rusticians, Laura has daughters…six of them! Laura is probably one of the most positive people you’ll ever meet. She loves kids, does foster care, and has a passion for helping troubled teens. She likes riding bikes, and most especially riding a tandem bike with her husband. She loves outdoor adventures like canoeing, hiking, camping, and mountain climbing, but her favorite thing to do is visiting waterfalls, everywhere from Dominica to the back country of Tennessee. Chris decided he hadn’t had enough of Rustici, and joins the team again for his second year. A Nashville native, he joins us from Miami University of Ohio. He’s baaack! Chris interned with us for two summers, and worked part-time with us for a third, and then finally decided he ought to join us full time post-college graduation. We’re excited to have him here as an official Rustician, where he’ll spend his time on Engine development. Chris claims to be an adequate juggler, and might be the only juggling Rustician! We’ll put this to the test and report back. Stay tuned! We’re pretty sure that Kyle is the only Rustician that regularly keeps up with Sri Lankan politics, and he has a good reason. Before joining us, Kyle spent a decade in Sri Lanka. He was teaching English and computer classes in a nonprofit school that he and his friends started. Yep. They started a school. He considers himself a homebody, even with a passport full of stamps. When not playing My Little Pony with his daughter, or getting beaten at video games by his son, he loves to read and catch up on his Netflix queue. Kyle is helping us do Engine integrations, and we couldn’t be happier to have him. Popular Rustici folklore tells it like this: Reid never played much pong, and one day, Tim Martin asked Reid when he was going to get to play a game of pong with him. Reid pointedly and specifically answered Tim with, “July 17, 2016.” Now, it should be noted that here at Rustici we like to have fun and celebrate things, so naturally, we quietly recorded Reid’s pong debut date in our calendars and when July 17 arrived, we were ready with custom designed tees, ice cream, and a crowd of Rusticians eager to witness Reid’s big pong debut (and Reid had no idea any of this was in the works). Reid played a game of pong that day, but has never been seen with a pong paddle since. Reid is also the youngest Rustician, but he’s an old soul. He likes rock/alternative music (and a little bit of metal), cars, video games, and math. Reid is working on SCORM Cloud, mostly database things. Catherine worked with Laura at two previous jobs, and when Laura was looking to hire someone to work alongside her in the accounting department, she knew that Catherine was exactly who she wanted to hire. And boy are we glad that Catherine agreed to come hang out with us here at Rustici! As our accountant, Catherine keeps our books in tip-top shape and makes sure all of our money (coming in and going out) is right where it needs to be. Catherine tried skiing once, and has since passionately vowed to never do it ever again. Instead, she’s fallen head-over-heels in love with snowmobiling, and gets as many runs in as she can each year on our annual co-vacationing trip. She also has a great poker face and has been known to come out victorious after a rousing Rustici game of Exploding Kittens. When she’s not at work, she spends her time with her 5 year old son, helping to coach his baseball team (he also likes bowling and soccer), and cheering on both college and pro football (her teams are Alabama and Dallas). She also loves Broadway shows, which is another good indicator that she fits right in here at Rustici. Sam is from Guildford, England. He moved to Nashville from London (where he worked in the Gherkin building.) Of course, Sam has a British accent. (Duh.) He likes relaxing on the weekends, occasionally going hiking or trying to get in a game of Snooker. He has a German Shepherd named Sampson (Samps), which Sam refers to as a “frenemy”. Sam really likes pancakes. He claims there there is a holiday in February called Pancake Day that’s widely celebrated in the U.K. that involves, well, eating pancakes. We still aren’t sure if Pancake Day is a real holiday or not, but we went ahead and celebrated this year just to be safe, and because we think Sam is a good guy and were happy to eat pancakes with him. Sam is working on SCORM Engine, and bringing us lots of “Brexit” jokes, which are greatly appreciated. Ryan was born in a small town in Indiana (population 3,000). Chasing a girl (his now wife) brought him to Nashville. Ryan is most passionate about his family, but he also really likes sports (Everton soccer, Cardinals baseball, and Hoosiers for anything college.) He very loosely identifies as a foodie and a beer snob, which just means he prefers IPAs to Bud Lights. Ryan claims that there’s nothing really weird or terribly interesting about himself, which has made him realize he needs to pick up a hobby or two. (He’s open to suggestions!) His claim to fame? He’s the great-great-great nephew of Grandpa Jones. Ryan will be working closely with our customers as an account manager, and we’re sure that our customers will like him just as much as we do. We knew Tara would have no problem making herself at home here when we saw her eyes light up at the mention of our annual co-vacationing ski trip. She got engaged in Vail and honeymooned in Banff, so it seems like there’s a pretty good chance she’ll join us on the slopes during our yearly trip. Not only does she love to ski, but she plays games (round of ping pong, competitive card games or the latest video game, she’s in!) and watches Game of Thrones. So, yep! She’s definitely one of us. Tara works in an area of our office that we fondly refer to as Friendship Hall. Friendship Hall is not only home to our marketers but also our account managers and sales team. It also seems to be the headquarters to a new and quickly growing cat lovers club. Tara’s cat is named Cole Porter, a.k.a. Cat King Cole, and Tara is the third Rustician in Friendship Hall to proudly claim an affinity for felines. Friendship Feline Fan Club, anyone? As our Digital Marketing Manager, she’ll take care of all things data for us including overseeing analytics and advertising campaigns, with one of her main objectives being to support and assist our sales team by generating inbound leads. When she’s not day-dreaming about naps, she really enjoys to spend time with her family and friends and catch up on her DVR. Lately it’s been recording shows like America’s Got Talent, The Voice, This Is Us and any/all of the Chicago series. There’s just one little problem with the addition of Avery to the Accounting Department. She is a passionate Auburn football fan. Which is all fine and dandy, except for the fact that Catherine Colligan, who sits directly across from Avery, is a die-hard Alabama fan. I don’t know much about sports, but even I know that this is a recipe for disaster come fall!!! We might have to temporarily relocate one of them to a different office for a few months. I suspect there will be some good stories to come out of this Departmental rivalry. Stay tuned! *Truthfully, we think she’s pretty rad regardless of what she’s here to do. Reed has the same name as Reid Wiggins. So now we have Reid, and Reeeed (emphasis on the ‘eeee’). “My main hobby is making noise,” he proudly told me, and does so on the bass guitar, upright bass and keyboard. As far as musicians go, we have quite a few of those around here now (not so shocking for an office located in Nashville, I suppose) and the addition of Reed has me believing that my dream of hosting a Rustici jam sesh night is closer to becoming true! His love for music doesn’t stop at playing. He also really enjoys trading listening recommendations, so if you’re looking for some fresh tunes, he’s your guy. I don’t have a great segue for this next fact, so I’ll just say it. His favorite celebrity chef is Guy Fieri, which I find to be fantastic. Reed says he is clumsy and jumpy and scares easily, which is good news for Chris Tompkins (our in-house scarer) and mostly just bad news for Reed. Reed’s a software developer, and we’re really quite pleased to have him here. In his life, Josh has worked as the vintner’s farmhand at le Clos de la Meslerie vineyard in Vouvray, France and stayed with a pilot in Sweden who offered to fly him to Goa, India if he was willing to sit in the plane’s jump seat for the 13 hour flight—he said yes. And those are only the stories he shared when I made him narrow his expansive travel memories down to some of his top moments! Travels aside, Josh describes himself as a jack of many trades who can do a lot of things poorly, including juggling and poi (which is fire spinning, if like me, you weren’t aware.) He has two dogs, enjoys rock climbing, and offered up a piece of advice at the end of our time together that I loved so much, I made him type it out as to not mince his words. Josh is a software developer for us, and we are so glad that he chose Rustici Software as his latest adventure. Luke is a Rustici-unicorn in that he does not share his name with anyone else, which feels rare and special these days. He’s a brand new Nashvillian, having just moved here from Maryland where he was born and raised. Working at Rustici comes with a certain set of perks, one of which is our drink refrigerator, which I keep stocked with over 30 varieties of beverages. When I gave Luke a tour of our office, we stopped at the refrigerator, where Luke informed me he mostly drinks water. ¯\_(ツ)_/¯ I think there’s a chance he expands his beverage repertoire in the next 6 months and will follow up at that time. Stay tuned. Luke’s first day in the office coincided with our most elaborate Thanksmas celebration yet. I can confidently say no one has ever received a more extravagant welcome! Luke is going to be doing some QA work for us, and we are really just thrilled to have him here. John and his family are new owners of several acres of land near the Tennessee/Alabama border, in “the sticks” of Tennessee as he explains it. He and his wife and their two children currently live close to the land while they imagine what type of house to build and what other creatures should call it home. Already home to his bees, they have dreams of sheep and plans to add chickens in the future. I’m really hoping we can take a company field trip there after he’s gotten everyone settled in, but that’s mostly just because I’ll want to see his silkie chickens. John watches Netflix from time to time, but mostly spends his free time working on puzzles with his two young kids and also enjoys cooking as means of relaxing. Like several other Rusticians, he likes his food spicy, but unlike our other in-house hot heads, he prefers using peppers over hot sauce and even grows his own preferred varieties at home. Color me impressed! John is a software developer working on Rustici Engine, and we’re thrilled to have him “spicing” things up here at Rustici Software. It was only a matter of time before Kyle found his way to working with us. After all, he’s connected to about half our employees through friendships or past jobs. Maybe it’s because he’s so friendly: his wife says he could befriend a lamp post. Before working here, Kyle worked in graphic design and even built eLearning courses at UL. From there, he moved into sales and now joins us as a Client Success Manager. If you want to talk about food, talk to Kyle. Not only do he and his wife enjoy experimenting with recipes, they also plan eating and drinking tours to various cities. His favorite city so far has been Savannah but his favorite restaurant was St. Augustine’s Preserved. Philip Fallin has come waltzing into our lives to help us with sales. We mean that literally… Philip is a competitive dancer. West Coast Swing, country, ballroom, you name the dance, Philip knows it. The things Philip loves about dance make him great at supporting our prospective customers: he’s passionate about getting to know people and building relationships. Before working at Rustici, Philip served as an account manager and salesperson at technology companies. He’s a great matchmaker; talented not only at helping folks figure out the right product for them but sometimes helping them find their soulmate–he’s matched two couples who’ve married! Cameron Gray is a builder. At work, he builds relationships with clients and he’s joined our team as a Client Success Manager. At home, he builds furniture. Last year, he and his wife gutted and renovated their 1962 ranch in Franklin and in his spare time, he builds anything from a coffee table to a record console. He loves figuring out how to do something and then sharing how to do it with other people, which will make him great at serving our clients. Cameron is a serious Arsenal fan. He’s played pick up in an adult soccer league and enjoys returning to his hometown of Atlanta to watch Atlanta United. He’s also passionate about cycling, which is his hands down his favorite hobby. He has big plans to bike into our office each morning during the warmer months. Michaela is always looking for ways to bring a smile to your face. Whether it’s with her hilarious voice of ‘Marcel the shell with shoes on’ or posing Tina the dinosaur alongside her alpaca friend to hold up signs and greet everyone who comes through our doors. Michaela enjoys coming up with fun ways to make each day feel special and already surprised us with a baby animal visit. This creativity comes naturally to Michaela as she has an art background and is currently practicing ceramics. She’s excited about finally moving her supplies out of her dining room and into a shared studio space. Michaela has managed co-working spaces and communities around Nashville and joins our team as our new shared Office Manager focused on creating employee happiness.